Am I the only one who is delighted with American Horror Story: Roanoke thus far? This is shaping up to be one of my favorite seasons of AHS, and that's saying something. 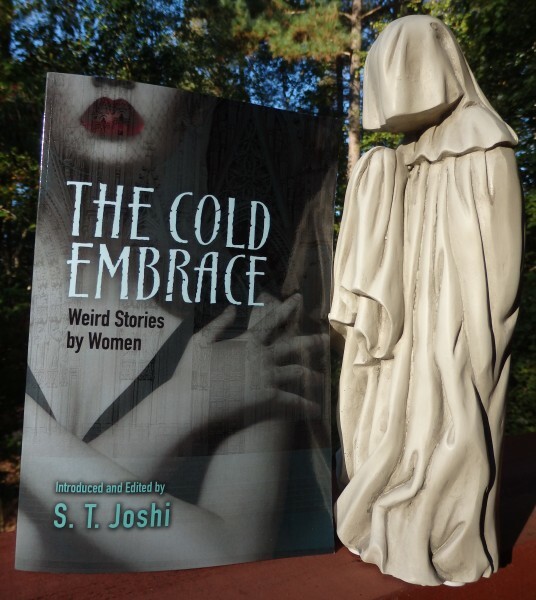 If you're looking for some classic reading for this season, you can't go wrong with the excellent The Cold Embrace: Weird Stories by Women, published earlier this year by Dover Horror Classics and edited by well-known scholar S.T. Joshi. Here's the official description: This original anthology presents 19 short stories that cover nearly a century of speculative fiction by women authors. Selections range from Mary Shelley's "Transformation" (1830), a pendant to Frankenstein in its themes and motifs, to "Where Their Fire Is Not Quenched" (1922) by May Sinclair, a tale of time travel that follows its heroine to Hell and back. Gripping narratives include Virginia Woolf's "A Haunted House," in which a ghostly couple revisit their former home; "A Wedding Chest" by Vernon Lee, a story of romance and revenge that unfolds in Renaissance Italy; and Charlotte Perkins Gilman's "The Yellow Wallpaper," recounting a woman's psychic possession by the previous occupant of her attic bedroom. Additional tales include E. Nesbit's "From the Dead," "The Eyes" by Edith Wharton, Elizabeth Gaskell's "Curious If True," and many others. Editor S.T. Joshi offers an extensive Introduction as well as notes on each of the authors. One of the spooky stories included is "Death and the Woman" by Gertrude Atherton (1893). You can listen to two different (and free!) Librivox recordings of the story here and here, and you can find an online version of the story here. "She knew that it was Death who was coming to her through the silent deserted house; knew that it was the sensitive ear of her intelligence that heard him, not the dull, coarse-grained ear of the body. "He toiled up the stair painfully, as if he were old and tired with much. work. But how could he afford to loiter, with all the work he had to do? Every minute, every second, he must be in demand to hook his cold, hard finger about a soul struggling to escape from its putrefying tenement. But probably he had his emissaries, his minions: for only those worthy of the honor did he come in person. "He reached the first landing and crept like a cat down the hall to the next stair, then crawled slowly up as before. Light as the footfalls were, they were squarely planted, unfaltering; slow, they never halted." Ooh!! I think I need this book in my life! Thanks for linking and recommending!! Ooh!! I think I need this book in my life! Thanks for linking and recommending!! Yay! It really is, IMHO. I got my nerve up and skimmed that story. Creepy!! Isn't it? I'm glad you think so, too! Your icon always gives me the giggles. It's so perfect! :-) Glad you like it! I quit watching American Horror Story because the hotel arc was just so bad! It wasn't really horror anymore, just a slasher movie seen in parts. But if it's changed back to its original standards, I may have to give it a go. The book sounds interesting. Another for my to-be-read pile! We quit watching the Hotel series of AHS, too, for the very same reason. This season feels much more in tune with the first two seasons, in terms of writing, at least to me. If you watch it, I'd love to know what you think! oh, I love this! How very lyrical this excerpt is (or perhaps it was the tone of the age in which it was written?). It was life coming for her, coming for the three of them. She felt it, sharp in her belly, the earthquake of baby-meeting-world so different from the butterfly flutters and the cage-stretching kicks of the prior months. She felt it, and held her breath through some of the pain (pain made joyous for the promise of what should come thereafter), gasping (and grasping!) at the sting-chill air in the small moments between contractions. And then she was *here*. Here, like she hadn't been in the Winter, or Spring or Summer. *Here*, and she fell, (like Fall) from the warm nest of womb, one final pink push into the busy world. Ah, welcome, my little one. My flower. My joy. My life. Oh, how beautiful and life-affirming! *standing ovation* I love this especially: "*Here*, and she fell, (like Fall) from the warm nest of womb..." Perfection. I am honored, dear Amy. So glad you enjoyed! Life-affirmation is so refreshing to this particular soul, dear Jan. Bless you, bless you-- I loved "she fell (like Fall)"
Thank you for sharing your gracious gifts of words. (((((((((((((((((((((((Mary)))))))))))))))))) thank you so much, Mary. I wish I might write a book of affirmation(s) just for you. Peace to you, dear Mary. My pleasure! I'm so glad it's of interest. Happy reading!